The cloud storage device mechanism represents storage devices that are designed specifically for cloud-based provisioning. Instances of these devices can be virtualized, similar to how physical servers can spawn virtual server images. They are commonly able to provide fixed-increment capacity allocation in support of the pay-per-use mechanism. Cloud storage devices can be exposed for remote access via cloud storage devices. A primary concern related to cloud storage is the security, integrity, and confidentiality of data, which becomes more prone to being compromised when entrusted to external cloud providers and other third parties. There can also be legal and regulatory implications that result from relocating data across geographical or national boundaries. Another issue applies specifically to the performance of large databases. LANs provide locally stored data with network reliability and latency levels that are superior to those of WANs. Files – Collections of data are grouped into files that are located in folders. Blocks – The lowest level of storage and the closest to the hardware, a block is the smallest unit of data that is still individually accessible. Datasets – Sets of data are organized into a table-based, delimited, or record format. Objects – Data and its associated metadata are organizes as Web-based resources. Each of these storage levels is commonly associated with a certain type of technical interface which corresponds to a particular type of cloud storage device and cloud storage service used to expose its API (Figure A.18). Legacy network storage most commonly falls under the category of network storage interfaces. It includes storage devices in compliance with industry standard protocols, such as SCSI for storage blocks and the server message block (SMB), common Internet file system (CIFS), and network file system (NFS) for file and network storage. File storage entails storing individual data in separate files that can be different sizes and formats and organized into folders and subfolders. Original files are often replaced by the new files that are created when data has been modified. When a cloud storage device mechanism is based on this type of interface, its data searching and extraction performance will tend to be suboptimal. Storage processing levels and thresholds for file allocation are usually determined by the file system itself. Block storage required data to be in a fixed format (known as a data block), which is the smallest unit that can be stored and accessed and the storage format closest to hardware. Using either the logical unit number (LUN) or virtual volume block-level storage will typically have better performance than file-level storage. Various types of data can be referenced and stored as Web resources. This is referred to as object storage, which is based on technologies that can support a range of data and media types. Cloud storage device mechanisms that implement this interface can typically be accessed via REST or Web service-based cloud services using HTTP as the prime protocol. The Storage Networking Industry Association’s Cloud Data Management Interface (SNIA’s CDMI) supports the use of object storage interfaces. 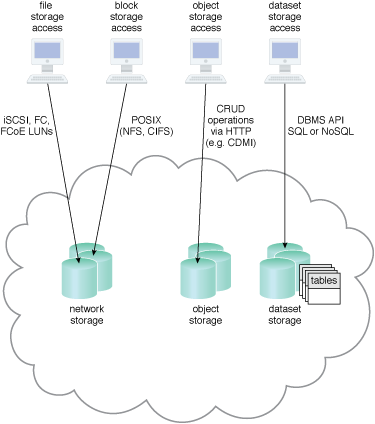 Cloud storage device mechanisms based on database storage interfaces typically support a query language in addition to basic storage operations. Storage management is carried out using a standard API or an administrative user-interface. This classification of storage interface is divided into two main categories according to storage structure, as follows. Traditionally, many on-premise IT environments store data using relational databases or relational database management systems (RDBMSs). Relational databases (or relational storage devices) rely on tables to organize similar data into rows and columns. Tables can have relationships with each other to give the data increased structure, to protect data integrity, and to avoid data redundancy (which is referred to as data normalization). Working with relational storage commonly involves the use of the industry standard Structured Query Language (SQL). A cloud storage device mechanism implemented using relational data storage could be based on any number of commercially available database products, such as IBM DB2, Oracle Database, Microsoft SQL Server, and MySQL. Challenges with cloud-based relational databases commonly pertain to scaling and performance. Scaling a relational cloud storage device vertically can be more complex and cost-ineffective than horizontal scaling. Databases with complex relationships and/or containing large volumes of data can be afflicted with higher processing overhead and latency, especially when accessed remotely via cloud services. Non-relational storage (also commonly referred to as NoSQL storage) moves away from the traditional relational database model in that it establishes a “looser” structure for stored data with less emphasis on defining relationships and realizing data normalization. The primary motivation for using non-relational storage is to avoid the potential complexity and processing overhead that can be imposed by relational databases. Also, non-relational storage can be more horizontally scalable than relational storage. The trade-off with non-relational storage is that the data loses much of the native form and validation due to limited or primitive schemas or data models. Furthermore, non-relational repositories don’t tend to support relational database functions, such as transactions or joins. Normalized data exported into a non-relational storage repository will usually become denormalized, meaning that the size of the data will typically grow. An extent of normalization can be preserved, but usually not for complex relationships. Cloud providers often offer non-relational storage that provides scalability and availability of stored data over multiple server environments. However, many non-relational storage mechanisms are proprietary and therefore can severely limit data portability.